The devastating psychological effect of war upon soldiers in the front line is something of a cliché. All those young men who came home from the trenches and said nothing because they were not equipped with words fit to describe the horror, and because once home that other world seemed at the same time both unreal and too terrifyingly real to co-exist with daily, ordinary, civilian life. Today a version of war is present in our very living rooms, courtesy of embedded cameramen and reporters, and we’ve all heard of Post Traumatic Stress Disorder. Yet do we really understand the experience of ending lives and being shot at in a desert on the other side of the world? Kevin Powers was a gunner with the US army inIraq in 2004/5. He has since become a poet and now, in response to the ‘What was it like out there?’ question, he is a novelist. The Yellow Birds tells the tale of Bart and Murph, 21 and 18 respectively when they land in Iraq. John Bartle’s is the voice and the consciousness. Both boys are provincials, likeable lads from nowheresville. Bart, being a little older and perhaps simply because of who he is, retains some detachment while observing and experiencing death all around him, but Murph loses focus and much more. Because through Powers’ skill we are quickly engaged with Bart, by the time we see such things through Bart’s eyes we are ready to face the worst with him. The worst is terrible, but the reader by now feels compelled to read right through. Mothers feature large in The Yellow Birds. At the boys’ communal send-off, their mothers are there beside them. When Murph’s solicits a promise from Bart that he’ll look after her son and bring him back safe, the reader has a sinking feeling that this is bound to end in tears, and it is no secret that the adventure ends badly for Murph. When Bart returns and shuts himself away from his friends and the world, his mother is baffled. He has to get away from her too. Mothers of young men who are in the military or have signed up will find this novel hard to read at first, but what seems initially to be brutal quickly evolves into an elegy for lost innocence. You will weep, but you will also know that while you read you are in the presence of truth. Episode follows episode, backwards and forwards in time and to-and-fro fromIraq to the United Stateswith a stopover in Germany. Everything adds to the picture, even the tragi-comic scene when upon demob the soldiers are given a sheet of paper, a questionnaire to establish their level of stress; any man suffering from any ‘disorder’ can be assured of the best ‘mental hygiene care’ possible. Confusion and obfuscation must not be allowed, even where they are the most obvious elements in a scenario; every incident and every man must be pinned down, categorized; boxes must be ticked. It would be hilarious if it weren’t appalling. The smell of wood fires burning, the hues and tones of sandy desert towns, dappled light falling through orchard leaves which has the same magical beauty wherever it is in the world – such sensory delights are given both immediacy and timelessness by Kevin Powers’ gift for poetry. Without reference to politics, strategy, morality or anyone’s God, and by taking us into one man’s heart and helping us see through his eyes, the author opens up our vision to the bigger picture. We all know that war is terrible, but most of us only know this from the comfort of our own homes. 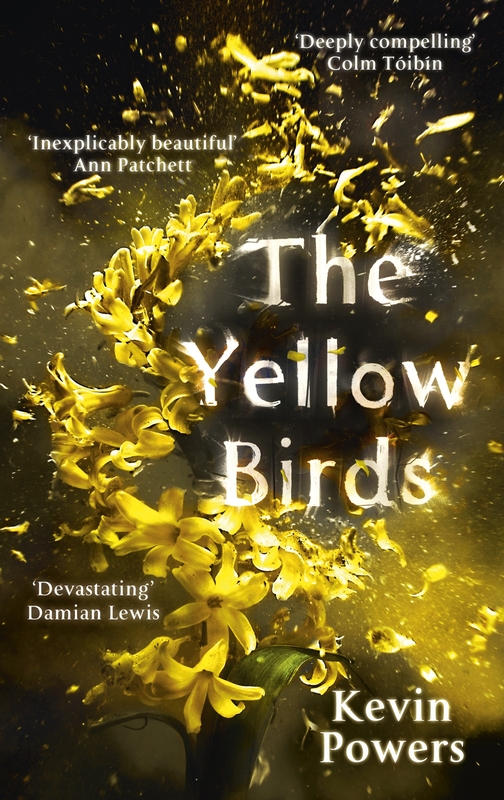 The Yellow Birds shows us just how terrible, how brutalizing and heartbreaking war is by describing a tiny detail – one passage in the lives of two young men. This is an impressive, moving and potentially important novel that needs to be read, as much for its humanity as for the horrors it so sweetly describes. And what are the yellow birds? Cannon fodder, according to the traditional US Army marching song printed at the beginning of the novel. But there are other allegorical references. They could for example be canaries. In a quiet moment in Iraq when Bart and Murph are reminiscing together, Murph remembers how his father brought a dozen canaries from the mine where they were used underground as an early-warning system for poisonous gasses. They were sacrificial down the mine but essential to the survival of man. But when given the opportunity of freedom in Murph’s mother’s orchard, they didn’t know what to do with themselves. They simply fluttered about, then came back to perch on top of the cages. Or perhaps ‘yellow bird’ is employed in the metaphorical sense of the one true love, the person with whom one is inextricably linked for ever unto death. Perhaps, perhaps not. 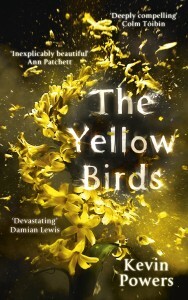 Powers’ yellow birds have a power to move us that is all their own.